Charles Albert Smith is a former American football wide receiver. 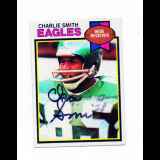 He played eight seasons in the National Football League for the Philadelphia Eagles. He played college football at Grambling State University. New Response (Success): Sent 1 Card in a SASE. Received it back signed. Th..